Collections >> The Church in the Southern Black Community >> Document Menu >> 315 - MRS. W. F. GRAHAM, Richmond, Va.
Sermons, Addresses and Reminiscences and Important Correspondence, With a Picture Gallery of Eminent Ministers and Scholars. Nashville, Tenn.: National Baptist Publishing Board, 1901. 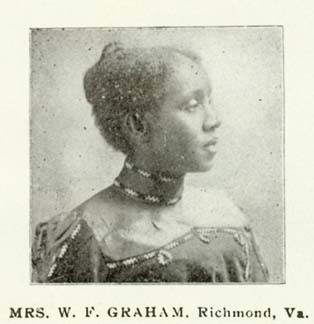 MRS. W. F. GRAHAM, Richmond, Va.